A new patch (1.04) has come through for NBA 2K19. As of this post, it’s only been released on PlayStation 4 and Xbox One, with the PC and Switch patches set to come through sometime soon. The patch will download automatically as long as your console is connected to the Internet; if you encounter any difficulties, try restarting or checking for updates manually. Patch 1.04 is a substantial update for NBA 2K19, containing a host of fixes, tweaks, and new functionality across a variety of modes. 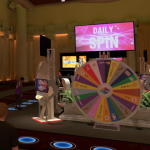 Notably, the requirements to unlock the Auction House in MyTEAM have been reduced to playing games (rather than winning them), the new shot clock rule regarding offensive rebounds has been implemented, additional Daily Spin prize wheels have been added to The Neighborhood, and various crashes have been addressed. There’s so much more than that however, so check out the full patch notes below. I’ve also added them to the update history for NBA 2K19 over in our Wiki. Feel free to share your impressions in the comments below, as well as join in the discussion here in the NBA 2K19 section of the NLSC Forum. UPDATE: Patch 1.04 is now available for the PC version of NBA 2K19. Users can now set a ‘Preferred Shorts Length’ in the Gear/Shoe category when creating a player. The shorts length will then be applied when applicable. A slight reduction in the effectiveness of pass lane steals that are not manually triggered. Reduced the frequency of defenders bodying up ball handlers into backcourt violations. The Dunk Contest ‘voting race’ will no longer appear during the in-game presentation after the All-Star break. Improvement to the MVP, Most Improved Player, and Rookie of the Year award selection logic. Team Card menu informational pages previously missing in the MyLEAGUE Online experience has been added. Will the new shot clock rule be implemented in modes that were started before the patch, such as MyLeague? Presumably. The notes did say that they’ll work with all previous game saves, so as far as I’m aware they will. Is the patch available to download for offline users? No, it’s for the legal/Steam version only, and you need to be online.